Compact and durable steel enclosure houses a state-of-the-art, professional universal 16-port USB hub (CE, ETL listed) powered by Cambrionix, the most respected leader in USB charge & sync technologies. 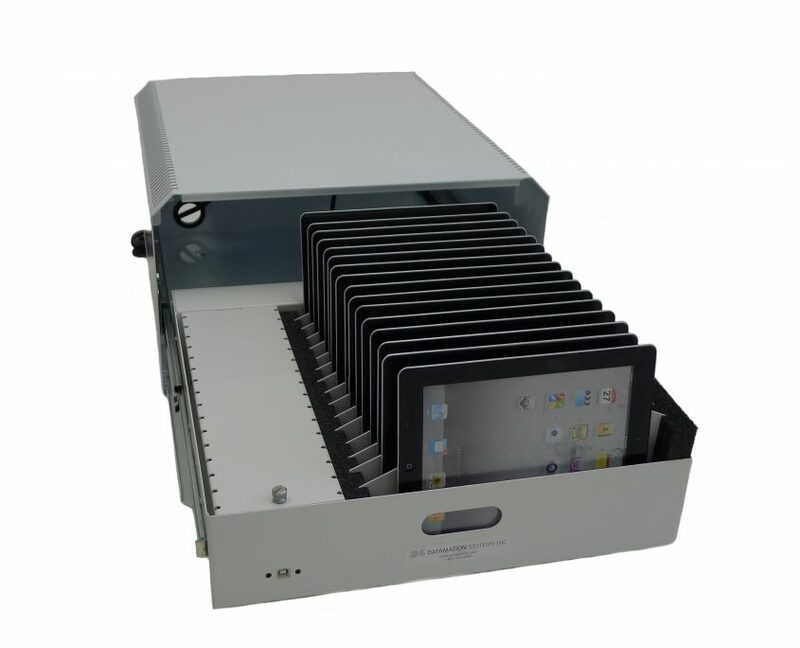 Can be used to charge and sync 16 iPads™. Features unique future-proof, field-updatable firmware and the Cambrionix ChaSync+ simultaneous charge and sync when connected to a host. LED status indicators at each numbered slot have default displays for charging, fully charged, syncing etc. Can be controlled by certain third-party software or customer scripts. The open API permits user-developed scripts for special applications that permit remote monitoring. Works with a variety of 3rd party MDM software (such as Ground Control) and Apple Configurator. External USB port at front of drawer allows easy connection to host for updates and syncing. Provides 2.1A at each port for all 16 ports when in charge mode. 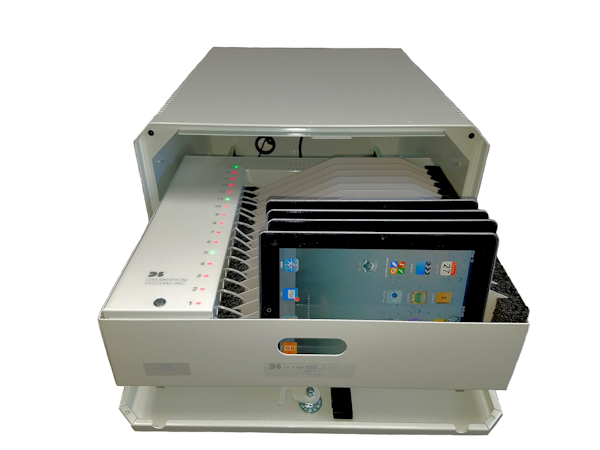 Dividers are removable and drawer bottoms have protective foam. Power supply: 225W, 5V, 85~264VAC, constant current limiting circuit, overload/overvoltage/short circuit protection, all applicable safety approvals. PSU is dual voltage 115/230 VAC. Includes a two outlet power strip (110 US power only). Enclosure can be bolted to tabletop. Optional cable bundles available or use your own. plugs into wall outlet with cord (provided).